A group of Stephen F. Austin State University students and faculty members recently presented research at the National Council of Teachers of English Convention in Houston along with students from the Nacogdoches Independent School District. NISD students (pictured) presented on their experiences with Barrio Writers, a weeklong summer program offered at SFA that focuses on literature and creative writing. NACOGDOCHES, Texas - A group of Stephen F. Austin State University students and faculty members recently presented research at the National Council of Teachers of English Convention in Houston along with students from the Nacogdoches Independent School District. SFA has been offering Barrio Writers to the Nacogdoches community for four years, and many of this year's Barrio Writers participants from NISD acted as co-presenters at the convention. "This was a huge honor, as more than 6,000 people attended the convention," Burrow said. 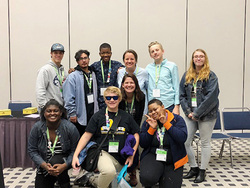 "The theme of this year's convention was Student Voice, so NCTE generously agreed to waive the conference attendance fee so our NISD students could present for free." "It's hard for me to find the words to explain what happened during the presentation. The youth were amazing as they spoke powerfully about Barrio Writers, their creative writing and the community we have created with Barrio Writers," Beal said. "They spoke about learning to use their voices - both in terms of speaking out about issues important to them and about using their writing abilities to advocate for themselves and others."